Police are appealing for the public’s help to locate a man who is wanted in connection with a serious assault in Ramsey this afternoon (Friday). 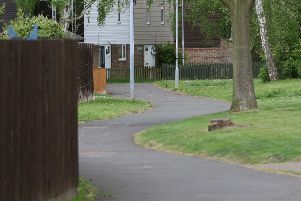 Officers were called at about 12.20pm with reports of the attack in Charles Close where a woman suffered serious injuries. The victim, a woman in her 30s, has been taken to hospital for treatment. Officers are now trying to locate 34-year-old David Edge who is believed to be in or around the Ramsey area. He is described as white, 5’ 9”, slim build with tattoos on both his arms and short blond hair. Anyone who knows of Edge’s whereabouts is asked to contact police immediately on 999.